David Moskowitz, author of "Caribou Rainforest," sat down with Hannah Weinberger, science & environment reporter for Crosscut, to discuss some of the most pressing issues facing the endangered mountain caribou and their habitat. 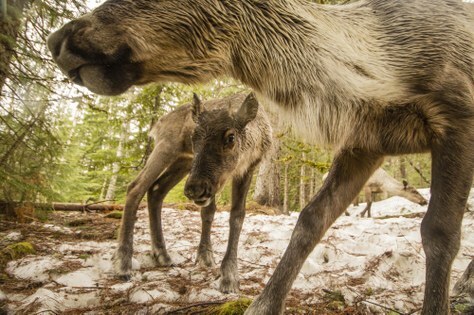 David Moskowitz’s work as a photographer, biologist, and wildlife tracker has led him deep into the world’s largest remaining inland temperate rainforest, home to the elusive, critically endangered mountain caribou. David spent years in the backcountry tracking and photographing these magnificent animals in order to understand and share their story with the world in Caribou Rainforest: From Heartbreak to Hope, a new book from Braided River. Understanding the mountain caribou and their unique ecosystem takes on an added urgency in light of the recent capture and relocation of the last wild mountain caribou known to cross into the contiguous United States. Here's what David has to say about the caribou, the relocation, and the legal framework that has failed to protect them. Your book is about caribou, but ultimately about the rainforest and ecosystems like it. Of all the animals in the rainforest, why center the story on caribou? So the focus on caribou is two-fold. One is that, that was just the pattern that's been laid out before me. So much of the conservation efforts in the region have hung on caribou habitat conservation. So they’re like the spotted owl of this old-growth forest. So already, just pragmatically, they are that species. But on more of a storytelling note, it was actually caribou that got me interested in the story [of the rainforest] to begin with. A few years ago, I had a month to kill, because I had an expedition cancel. And I was like, well, I'm gonna spend a month looking for mountain caribou. I had written about them in my two previous books, but had never actually seen or photographed one. So I was like, oh, I'm gonna go up to this place and go look for mountain caribou and get some photos of them and maybe make for an interesting photo essay. And so they were kind of the access point for me to this story. But also, I think they're a good choice because they're charismatic. They're something that draws attention. They're culturally very relevant. And one of the things that really stood out to me is listening to the indigenous people. Multiple different indigenous groups describe how caribou were a source of safety for their traditional economy. Like, "If times were hard, we knew we could go to the mountains and get caribou and feed ourselves. So the caribou took care of us." And then they see this flip, where it's like, "Wow, now we need to take care of the caribou." So the caribou were the protectors of the people, and now the people need a reciprocal relationship. Now the people need to care for these animals. So this goes hand in hand. What’s struck you about the ways you’ve heard people talk about the relocation? People just want to talk about caribou. There are stories about, "Oh, there's six animals left. What does this mean?" Or how the caribou are going to be removed, so it's like the end of the species. That's just the entry point into the real story here, the story that really matters to us, to humans. Those remaining animals, they're important and intrinsically valuable for their own sake and they represent a point of cultural connection for the indigenous people of that place, and have just immeasurable value in that way and for society at large, but that is just the tip of the iceberg and it's a conversation that begins and ends with the fate of a few caribou in a remote part of the Northwest. That we're logging old growth forests in endangered species habitat in the 21st century is even more mind-boggling. You note that one of the reasons all of this is such a tragedy, is that legislation (like Canada’s Species At Risk Act and our Endangered Species Act) enacted to save animals like caribou ultimately create new problems for ecosystems at large. How is this legislation either not doing its job in the rainforest or, even worse, expediting the losses? There's two things I'd say to that. One has to do with how the laws are written and our understanding when we wrote them and how that's changed. And then the second part is how they are enforced. To speak to the laws themselves, when the Endangered Species Act was written, we didn't understand how ecosystems work in the same way we do now. And so there's this idea of protecting individual, discrete species. We want to keep this animal from going extinct. And so, to save that species you can do things like breed it in captivity [which is what Canadian wildlife officials plan to do with the Southern Selkirk mountain caribou], or you can get rid of its competitors, or you can keep people from shooting it. Which is kind of all well and good for an individual species, but our concept of an individual species is lacking when you look at it in the modern context. Things don't happen in a vacuum. Caribou are a great example of this. It's not so much about keeping these particular animals alive, because what makes a mountain caribou is not so much its genetics, it's its relationship with that landscape. Mountain caribou are really a manifestation of an ecosystem. You'll find caribou all over the planet, but nowhere else in the world have they adapted to live in an environment with steep topography, massive amounts of precipitation, and these sprawling dense forests. And so the way mountain caribou live on the landscape has to do with their relationship with that ecosystem. And so we can’t take those animals, put them in a zoo, and keep them from going extinct — they’re not the same animal anymore. Putting an animal in a zoo would work for the Endangered Species Act, but it doesn't actually save the ecosystem. And [it's] the ecosystem and its set of processes that actually needs to be protected, for its own sake. Because there's millions of different organisms, not just caribou, that are accounted for there, and also because the rainforest is what's providing us with clean water, clean air, wood fiber for our homes, and all of these other various things — not to mention it provides the cultural context for the existence of all these indigenous peoples. So how is this existing legislation used today? Conservationists have recognized that what we need to attend to is the ecosystem. To do that, they'll use the Endangered Species Act or the Species At Risk Act to try to protect the ecosystem through habitat protection of an individual species within that ecosystem. But that is flawed because, for instance, if the caribou disappears, then maybe the habitat protection will disappear. Or maybe you'll apply the Endangered Species Act or the Species At Risk Act in ways that will protect the caribou but not actually deal with the ecosystem. So for instance, we could literally remove 90 percent of all of the moose from the ecosystem [that attract wolves] and kill as many of the wolves as we can, and then the caribou will do better. But we obviously haven't done anything to adjust the systemic problems for the ecosystem. There’s an irony here. 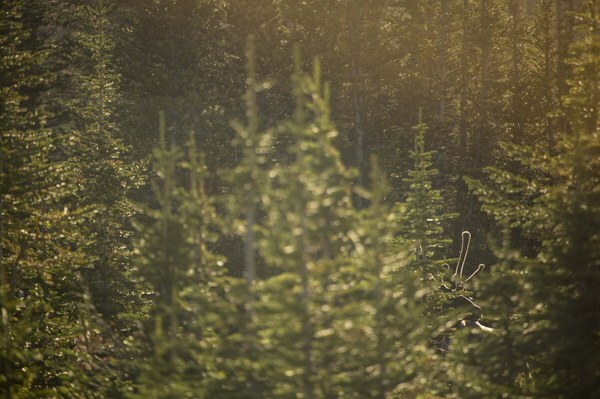 Traditionally these old growth forests were the refuge habitats of caribou. They didn't have to deal with competitors or predators — nothing else could live there. So the forest protected the caribou. But now, it's actually the caribou that's protecting the forest in that there's all of this "habitat" protected for endangered caribou. And so it's literally the presence of the caribou that's keeping that forest on the ground. Originally published on Crosscut.com. Read the full interview here. Join us for BeWild with David Moskowitz on February 12. David’s work as a photographer, biologist, and wildlife tracker has led him deep into the world’s largest remaining inland temperate rainforest, home to the elusive, critically endangered mountain caribou. David spent years in the backcountry tracking and photographing these magnificent animals in order to understand and share their story with the world in Caribou Rainforest: From Heartbreak to Hope, a new book from Braided River. He will share the stunning images captured over the course of his hiking and skiing expeditions in search of the notoriously shy woodland caribou and discuss what he has discovered about this fragile ecosystem and the unique animal that both depends on and defends it.